Ocean conservation group Oceana is starting to roll-out a new series of public-service-announcements, both print and video, to highlight the plight of the world's sharks. And if you're looking for information on sharks, what better place to come than Bimini? A few months back, the Bimini Sands Resort & Marina welcomed actress January Jones and Oceana to the island for work on their upcoming video PSA's. January came to Bimini to work with the Bimini Biological Field Station in the hopes of getting some more hands-on experience with sharks. Now she's taken what she learned here, and is helping get that information to the public. Check out the latest news from January Jones' work with Ocean here. And check out the photo (above) of January Jones discussing sharks with Bimini Sands' Recreation directors Katie and Grant. 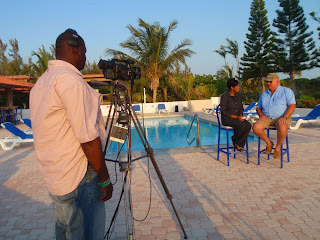 Bimini Sands has hosted numerous film teams and production crews over the years, and most recently we welcomed the Bahamas' own ZNS Network for two days of live broadcasting from the resort. In addition to broadcasting their regular evening news show, ZNS interviewed Bimini Sands owner Frank Cooney, facilities manager Emil Potier, and office manager Viveca Lubin. April is Coastal Awareness Month in the Bahamas. 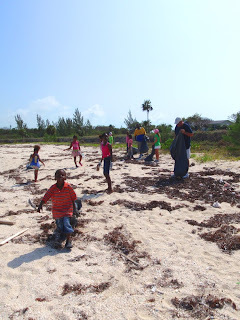 Every year during April, the Ministry of Tourism helps organize events and clean-up campaigns around the islands, in addition to making an extra effort to educate both locals and visitors about the importance of the Bahamian environment. 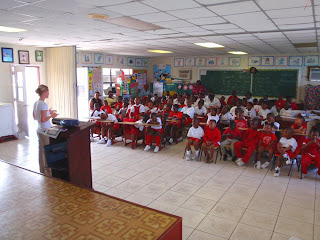 This year, the team from Bimini Sands was asked to help out. During the first week of April, a team from the Bimini Sands Recreation & Activity Center teamed up with the SharkLab to give a series of presentations and lectures at all three of the schools on North Bimini. First was the Holy Name Catholic School, followed by two separate presentations at the Bimini All Ages School, and finally the Gateway Christian Academy. The goal of these presentations was not only to provide information to the students, but also to motivate them to join us in the Beach Clean-Up on April 4. And it seemed to have worked. Both North and South Bimini had great turn-outs for the Beach Clean-Up, and after a few hours of hard work we were able to remove several hundred pounds of trash and debris from Bimini's western beaches. So far, Coastal Awareness Month has been a great success, and we've still got 3 weeks left to go!